In addition to Chicago's numerous cultural and athletic activities, there are many excellent opportunities to explore Mother Nature's bounty. 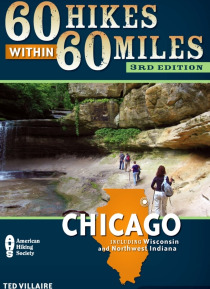 From the dunes of Lake Michigan to the hills and lakes of the northwest to the prairies of the south, hikers will find a trail to their liking in this updated edition of 60 Hikes within 60 Miles: Chicago.Hikes were chosen for their scenic appeal, but they we… re also chosen for their historic attractions. The extensive key-at-a-glance information makes it a snap to choose a hike based on length, difficulty, and scenery. Helpful lists highlight the best hikes for children, for wildlife viewing, and other categories.Whether a long-time Chicago resident or vacationer to the area, this updated guide will make choosing the right hike easy and enjoyable.